Rank: #62 out of 269. Go anywhere, talk to anyone, and interact with everything! Kill any NPC without sacrificing your progress, and speak to every animal. Even ghosts might be hiding a secret or two! Blast your opponents with elemental combinations. Use height to your advantage. Master over 200 skills in 12 skill schools. Play with your friends online (up to 4 players) or in local split-screen with drop-in/drop-out multiplayer. PvP hot-seat mode: Battle your friends in round-robin, hero to hero! Story mode: A new difficulty setting for players who wish to enjoy the lauded narrative, but still want to enjoy the combat. An entirely re-written journal to catalogue your journey and reflect on your quests. Character romance, disagreements, and unique quest-lines pushing the boundaries between fellowship and feud! Divinity Original Sin 2 is a very popular option on the higher end of the price range. It's in the top 3 bestselling PS4 games and has dozens of popular alternatives in the same price range, such as DiRT Rally or Overcooked! 2 . 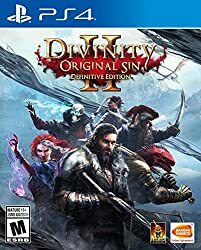 Divinity Original Sin 2 is $10 more expensive than the average PS4 game ($19.99).